Cavite's definitely no stranger when it comes to street art. In my daily commute to and from Cavite for years, I've always seen these bits and pieces of colorful graffiti along Aguinaldo Highway. Cy and I would photograph and share new works we'd see back then. In fact, I think this might be where all my curiosity and fascination stemmed from. There's just something raw and real about art in public spaces. The curiosity turned into these graffiti hunts I did in BGC last 2015 and 2016. I began to unconsciously spot murals and artworks when I'm in transit or just in new places. Last year, I devoted a morning in our trip to Hong Kong to see street art. Earlier this year, I pushed my friends to do a photo walk in Haji Lane in Singapore, and I've convinced my awesome friends to include street art spotting in our future travels. Hehehe. I missed last year's Paghilom arts festival, so I'm really grateful that there's another event that would showcase these amazing local graffiti artists. You can check out the details about Kulay Cavite Mural Festival below for more information and the week-long schedule. See you on the 22nd! 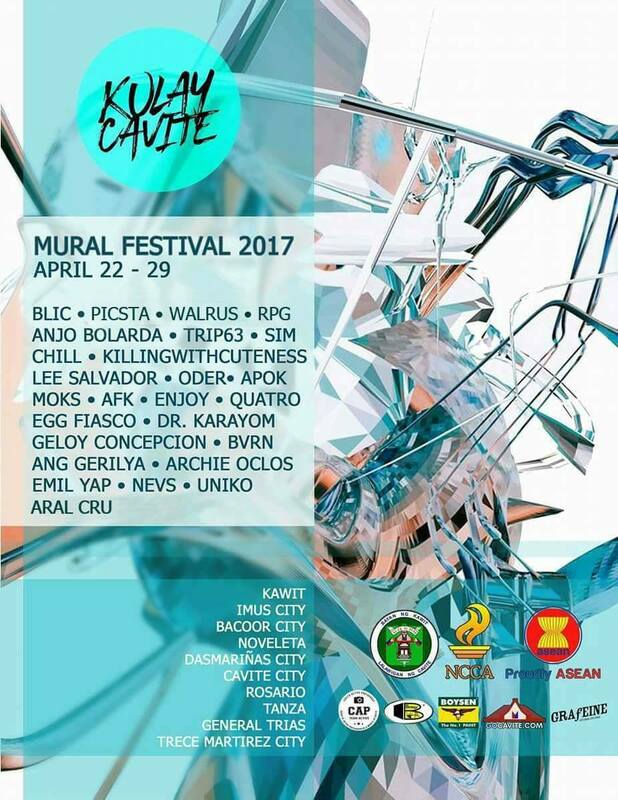 Supported by the National Commission for Culture and the Arts (NCCA), the Kulay Cavite Mural Festival 2017 is an 8-day event that will be staged from April 22 to April 29, 2017 in Kawit, Cavite. This provincial-wide festival invited more than 40 established street artists and muralists to paint Cavite's historic identities in public walls within the municipalities of Bacoor City, Noveleta, Kawit, Cavite City, Rosario, Trece Martires, Imus, Tanza, Dasmariñas City and General Trias. In this mural event, the visual artists will be given six (6) days from April 23 to 28, 2017 to paint using their style with concepts that are recommended by the participating local government. The kick-off party will be held on April 22 and the closing ceremony on April 29 at the Freedom Park, Kawit, Cavite welcoming the public in a FREE event. "Time has come for us to command art. Time has come for us to use art as a weapon." This quote from Tanya Jizelle, one of the project directors, talks about the festival's aim to alleviate street art notoriety, to promote local tourism by using street art as an alternative tool and to be in par with other mural festivals around the globe. The event will include graffiti crews and artists hailing from Cavite and greater Metro Manila such as Walrus Crew, RPG Crew, Archie Oclos, Ang Gerilya, Anjo Bolarda, Sim, Trip63, Killingwithcuteness, BLIC, Lee Salvador, Aral Cru, Geloy Concepcion, Dr. Karayom, Emil Yap, Oder, Apok, and RJ “Bvrn” Saquian. Kulay Cavite's organizers, Moks Cresencio and Tanya Jizelle, decided to make this mural festival as a tribute of devotion to their birthland and to their fellow Caviteños. The Kulay Cavite Mural Festival is in partnership with the Provincial Government of Cavite, Cavite Provincial Tourism Office, Bosny Philippines, Boysen Paints Philippines, and the Municipal of Kawit, Cavite, and in collaboration with GOCavite.com, Cavite Active Photogroup (CAP) and Grafeine Studios. For more information, you can email us at kulaycavite@gmail.com or call us at +63 956 504-2277 or +63 927 671-6668. Please click here to see the official festival schedule and to keep yourself updated.